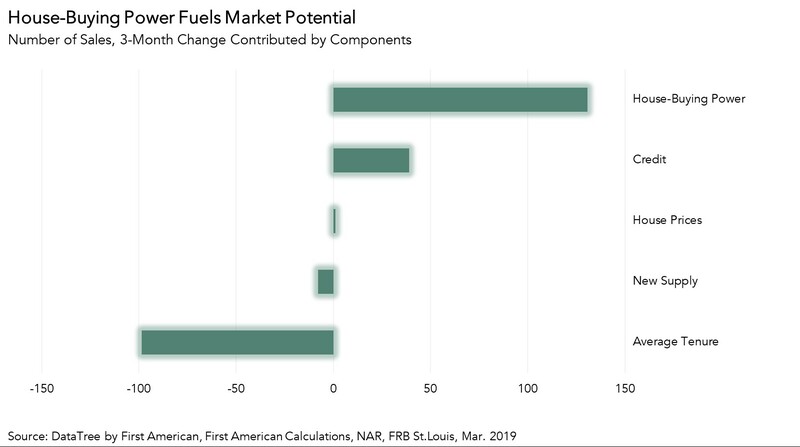 First American’s most recent Potential Home Sales model for January 2019 found a 5.7 percent decline in the market potential for existing home sales, compared to the previous year. Increasing tenure length (the length of time a homeowner stays in their home before moving) was the most prominent factor leading to this decline. Compared to the previous year, tenure length among existing homeowners has increased nine percent. This was largely driven by the rising-rate environment that characterized most of 2018, which dis-incentivized homeowners from moving. With a new mortgage at a higher rate, their monthly payments would increase, even if they borrowed the same amount of money. So, many existing homeowners chose to remain in their home, further constraining the supply of available homes for sale. Increasing homeowner tenure and a housing supply shortage continues to put downward pressure on sales. 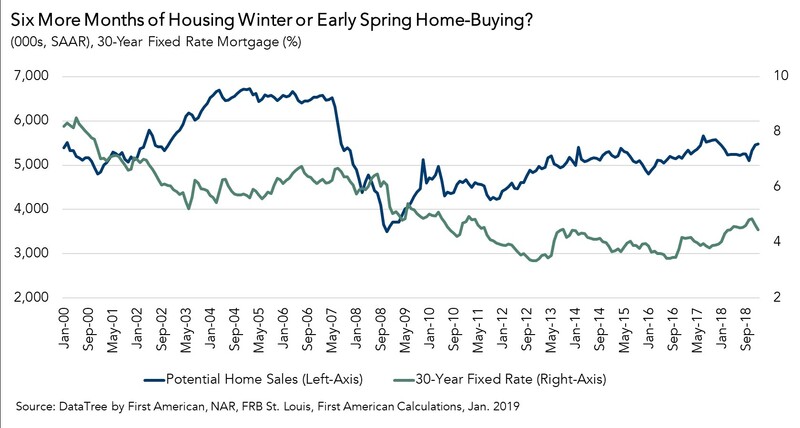 In January 2019, existing-home sales declined to their lowest level in more than three years, while the availability of homes for sale continued to run near historic lows. Compared to December 2018, the market potential for existing-home sales fell 0.6 percent in January 2019 (approximately 30,000 home sales), and 5.7 percent compared to one year ago (approximately 218,000 home sales). The market is underperforming its potential by 3.2 percent, or an estimated 165,000 (SAAR) sales. Based on our dynamic simulation Potential Home Sales Model, below are the driving forces shaping housing market potential today. Increasing Tenure: Tenure length, the average length of time someone lives in their home, jumped to seven years during the aftermath of the housing market crash between 2008 and 2016, and this trend continues to impact the housing market. According to the most recent data from January 2019, tenure length has increased 9 percent compared with a year ago. Increasing tenure length reduced the market potential by 391,000 potential home sales compared with one year ago. Falling House-Buying Power: House-buying power is how much home one can afford to buy given household income and the prevailing mortgage rate. Mortgage rates in January were 0.43 percent higher than they were a year ago. The increase in mortgage rates drove a decline in house-buying power and reduced the market potential by 57,000 potential home sales. Tight Credit Standards: When lending standards are tight, it becomes more difficult to qualify for a mortgage to buy a home. Likewise, when standards are looser, it’s easier to get a mortgage and buy a home. Because a homeowner’s decision to sell is often driven by their decision and ability to buy, tighter credit standards increase tenure length. When homeowners are less likely to receive mortgages for a new home, they are more likely to stay in their current home. In January, credit tightened further compared with last year, which reduced housing market potential by 2,000 potential home sales. Low Supply: The lack of supply and the fear of not being able to find something to buy keep many homeowners from selling. 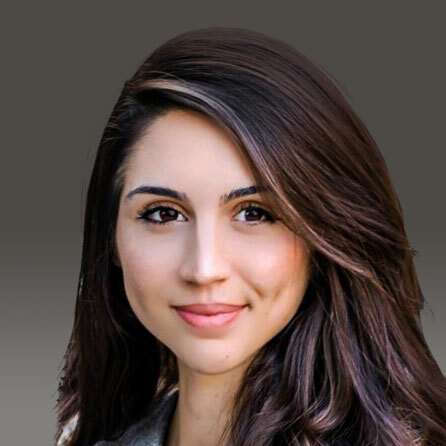 As new supply enters the market, the risk of not being able to find something to buy lessens and homeowners’ confidence in the decision to sell their existing homes grows. 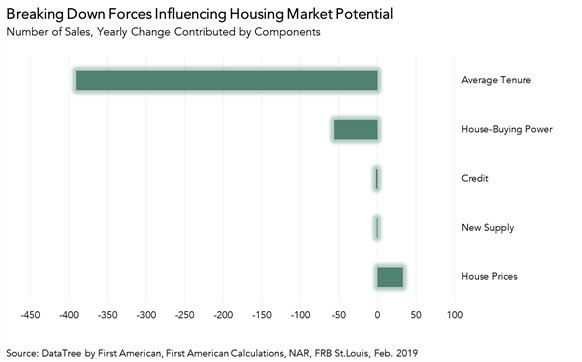 Compared with last year, the lack of new supply reduced housing market potential by 1,000 potential home—as new supply has remained relatively flat. Rising House Prices: As a homeowner gains equity in their home, they are more likely to consider using the equity to purchase a larger or more attractive home. However, if equity is low, homeowners are likely to remain “equity locked-in” to their home. Compared with one year ago, rapid house price appreciation increased housing market potential by nearly 33,000 potential home sales. Clearly, every homeowner’s decision to sell is different and influenced by personal and family preferences. However, the factors outlined above all influence that decision, and ultimately have an impact on the market potential for home sales. Although mortgage rates have recently declined, increasing house-buying power, mobility is significantly lower than recent norms. 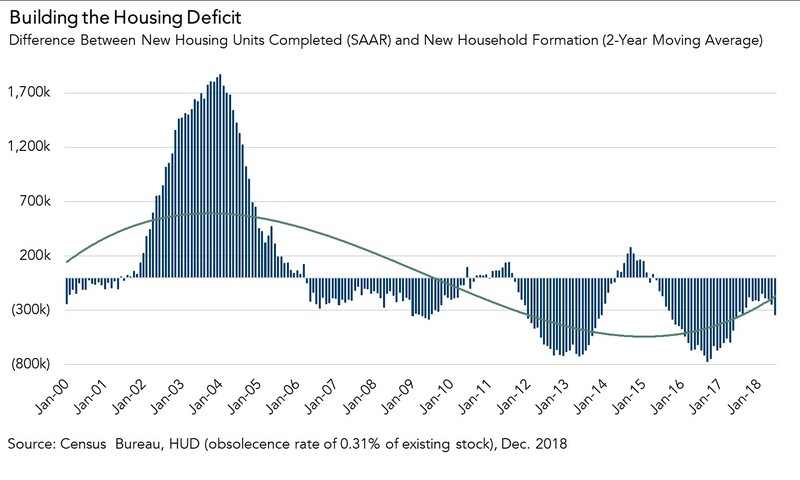 Our model indicates that if new housing supply and homeowner tenure were at historical average levels, existing-home sales in February should be 5.4 million SAAR. However, given today’s levels of supply and length of tenure, existing-home sales are expected to be approximately 5.0 million SAAR. The ongoing supply shortage and rising tenure length contributed to a loss of about 300,000 SAAR existing-home sales last year, according to our model. One can’t buy what’s not for sale. Six More Months of Housing Winter or Early Spring Home-Buying Season?